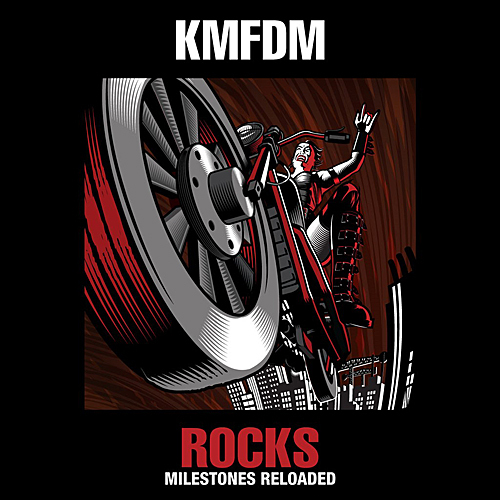 Ultra Heavy Beat sensation KMFDM has announced the release of the band’s twentieth album – titled ROCKS – Milestones Reloaded. Once again featuring cover artwork by Aidan “Brute!” Hughes, ROCKS… is a “best of” retrospective featuring tracks selected personally by Sascha Konietzko and Lucia Cifarelli to make for an “ideal playlist for a live set.” Among the selected tracks are a number of remixes by the likes of CHANT’s Bradley Bills, Dope Stars Inc.’s Victor Love, Marco Trentacoste, and KMFDM members Andy Selway and Konietzko himself. ROCKS… will be available in multiple formats, including CD, 2LP-vinyl, digital, and a CD+DVD mediabook. This album marks KMFDM’s first release with earMusic, and will be released on September 9, 2016.